Western Sahara Resource Watch today launched a report on the French oil company Total’s irresponsible comeback in occupied Western Sahara. The company carries out exploration in the territory despite the UN legal office stating it would be in violation of international law. WSRW estimates in its report that Total’s recently terminated investments in seismic studies during the last year has reached approximately 75 million USD. A subsidiary of China’s state oil company has assisted Total in its exploration, which ended in July. Download the report 'Totally wrong" here. “Total shows a complete disregard of basic principles of corporate social responsibility. It refuses to listen to any talks of the legitimate rights of the people of the occupied territory”, stated Erik Hagen, chair of Western Sahara Resource Watch. In 2001, Morocco for the first time issued oil licences in Western Sahara, a territory they invaded in violation of international law. One of the two licenses was given to Total. 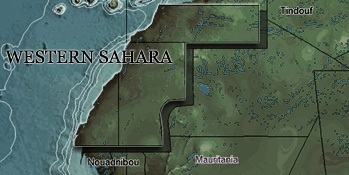 A few months later, the UN Legal Office responded to the affair, stating that any further exploration would be in violation of international law unless the Saharawis consented to it. Yet Total has continued to renew its license without seeking the consent of the Saharawi people. Total holds the biggest block of all the oil companies involved in occupied Western Sahara today – Total’s block is the size of Portugal - and has from July 2012 to July 2013 carried out the most advanced and expensive seismic studies ever. Concerns raised regarding the rights of the Saharawi people have been rejected by the company, claiming it does not want to engage in politics. Total does not wish to respond to questions regarding their plans. “We now urge the owners of Total to put immediate pressure on the company. If Total fails to terminate its unethical involvement, we ask shareholders to stop their investments. Through its activities over the last year, Total has revealed its real intention to find oil in Western Sahara in partnership with the Moroccan government”, stated Hagen.